A contingency is defined as an existing condition, situation, or set of circumstances involving uncertainty as to possible gain (referred to as a gain contingency) or loss (referred to as a loss contingency) to a government that will ultimately be resolved when one or more future events occur or fail to occur. GASB Statement 10, Accounting and Financial Reporting for Risk Financing and Related Insurance Issues applies to loss contingencies related to the risks of financing related to torts (litigation), theft of assets, business interruption, errors and omissions, job related illness or injury, acts of God, and other risk assumed by a risk pool. GASB Statement 62, Codification of Accounting and Financial Reporting Guidance Contained in Pre-November 30, 1989 FASB and AICPA Pronouncements applies to other loss contingencies such as uncollectability of receivables, encumbrances, guarantees, the pledge of the government's full faith and credit on G.O. debt intended to be financed by enterprise revenues, and various types of uncompleted contracts where the city/county/district is obligated to perform. Despite guidance in two separate statements, the accounting treatment is essentially the same. While gain contingencies are recognized when the gain is actually realized, loss contingencies are susceptible to accrual and disclosure requirement depending upon several factors. Not all uncertainties inherent in the accounting process give rise to contingencies as that term is used here. Estimates are required in financial statements for many ongoing and recurring activities of a government. The mere fact that an estimate is involved does not, in and of itself, constitute the type of uncertainty referred in this section. Reasonably possible. The chance is more than remote but less than likely. The determination as to the probability of an unfavorable outcome factors into the accounting treatment. Governments should work with their legal counsel to assess probability for claims during preparation of the financial statements. Governments should monitor for any change that might affect the financial statements up until their issuance. Contingent losses, net of reasonably certain expected insurance recoveries, must be reported in the government wide and proprietary fund financial statements as liabilities (and a related loss or expense) when they are both “probable” and “estimable”. Otherwise, they might require note disclosure. 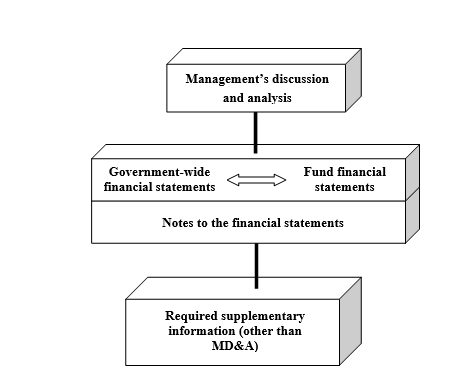 For other possibilities for recognition in the financial statements, see the chart in section 3.4.15.90. In governmental funds, the liability is recorded when the amounts have become due and payable (i.e. the claim is settled or a judgement has been reached but the payment has not yet been made). Governments should also work with legal counsel or other knowledgeable parties involved in the claim to determine the estimate of the loss. The “estimable” criteria is also met if the expected loss is a range. When some amount within the range appears at the time to be a better estimate than any other amount within the range, that amount should be accrued. When no amount within the range is a better estimate than any other amount, the minimum amount in the range should be accrued. Governments should monitor for changes that affect the ability to prepare an estimate, or the amount or range of an estimate, and consider the effect on the financial statements up until their issuance. The claims liability must also include the incurred but not reported (IBNR) claims liability, when applicable. This is related to the claims that might have been incurred as of or prior to the balance sheet date, but are not yet received. It might be helpful to engage an actuary to assist with this estimate, although it is not required to do so. For further guidance on these liabilities, refer to the GASB Codification, C50 Claims and Judgements. Expected insurance recoveries are those where the government can reasonably expect it has insurance coverage or participates in a risk pool that will pay for the claim on their behalf. In situations where the insurer admits or acknowledges coverage, the government should be in a supportable position to offset a contingent liability by the expected recovery. However, in the following instances, the government might not be in a supportable position to offset the liability and should evaluate the likelihood that it will be required to pay its own claims. There should be no disputes, disagreements, or other uncertainty with regard to the coverage of the claim(s). The pool or insurance company must also be financially solvent and in a financial position to be able to pay the claim(s). For deductibles or self-insured retention (any dollar amount to be paid by the insured before the policy will pay). If there is a deductible or an SIR, the government should accrue for its portion of unpaid claims, both reported and IBNR. If it's probable that the local government may be reassessed fees by the risk pool due to the risk pool experiencing excessive losses, then a liability should be accrued. An unasserted claim is one that the entity (or its legal counsel) is aware of, but has not been formally filed or otherwise asserted. A government must evaluate asserted claims and determine if there is a corresponding accounting treatment. This evaluation begins with the evaluation of the probability of the claim being actually asserted. 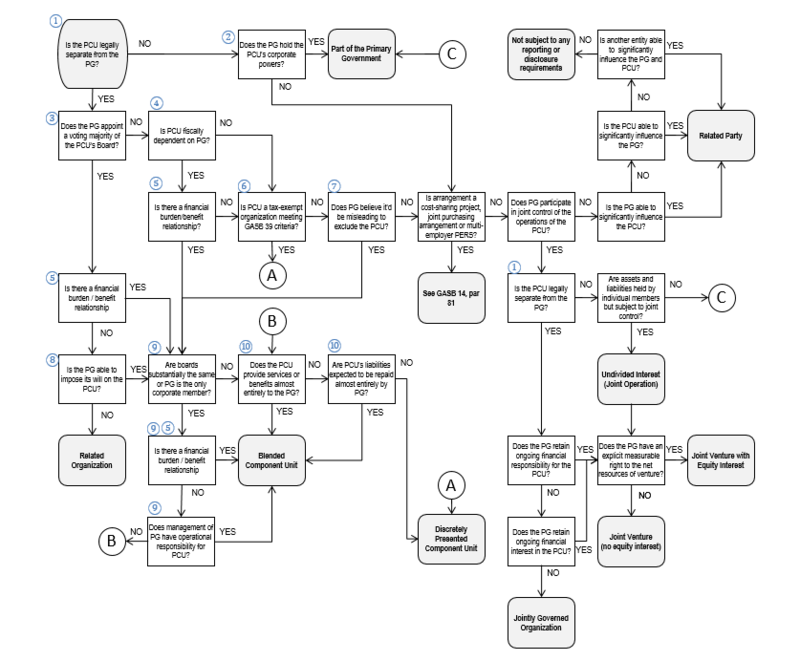 For the corresponding accounting treatment, see the chart in section 3.4.15.90. If no accrual is made because the contingency does not meet the probable and estimable criteria, a disclosure might still be required, see the chart in section 3.4.15.90. Such disclosures should indicate the nature of the contingency and meet any additional disclosure requirements described in the chart, where applicable. A disclosure should also be made in the situation where a liability was accrued, but where it is at least reasonably possible that the loss exposure exceeds the amount accrued. After the date of an entity's financial statements (i.e. balance sheet date), but before those financial statements are issued, information may become available indicating that an asset was impaired or a liability was incurred as of the date of the financial statements or after the date of the financial statements. 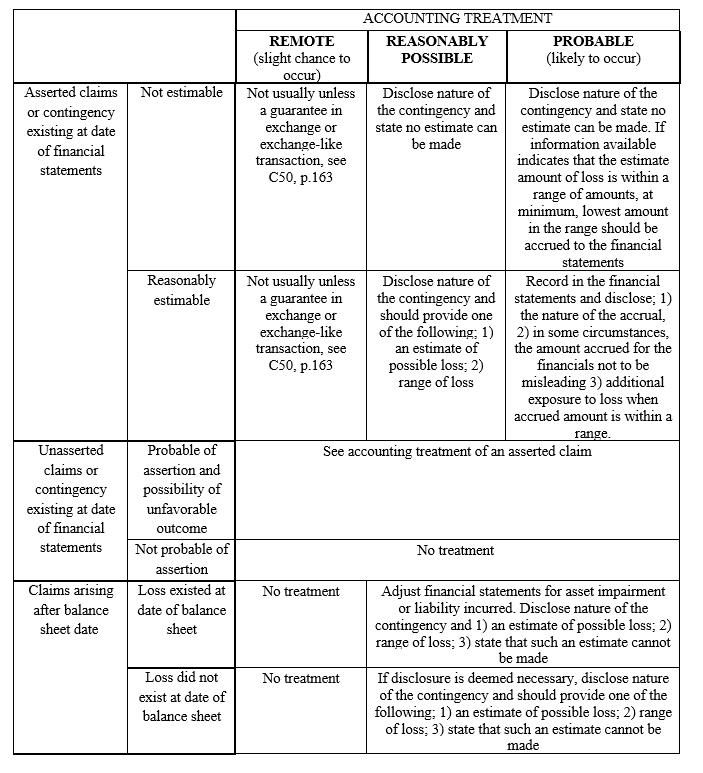 See the chart in section 3.4.15.90 for details on the accounting treatment for either of these potential situations.